Figure 1: The grey curve is the vertical paddle position and the dashed, vertical lines mark the paddle strokes (periods). There are four distinct orbits: 1, 2, 3, and 5. Orbit 4 is the same as 3, but shifted, and 6 and 7 are the shifted versions of 5. In the video above, we introduce the notation we use for the orbits (we use the notation introduced by T. Heimsch and R. Leine). Number 1 is a orbit, which reads as follows: The ball motion has a period of 1 paddle stroke and there are two impacts per period. The period corresponds to the number of paddle strokes one can count before the ball motion repeats itself. This is best explained in the video above. 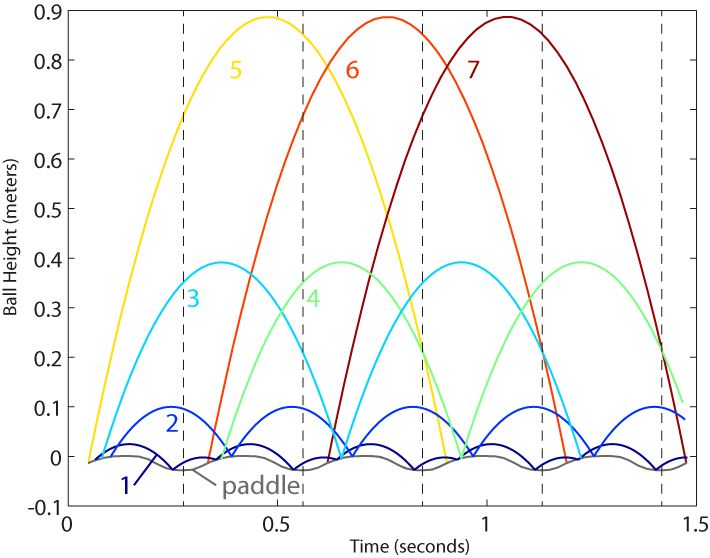 Another example is orbit 2, which is a orbit: There is one impact and the period is one paddle stroke. Orbits 3 and 4 are , and orbits 5,6,7 are orbits. Lastly, we introduce letters to differentiate between shifted versions of the same orbit: Number 7 is the orbit and refers to orbit 5 and to 6. In total, we find 7 different stable ball motions. There are different classifications of stability. An important distinction is between local and global stability. The ball orbits are locally stable. That means that as long as the ball stays close to the ideal path along the periodic orbit, the ball stays in that orbit. If the ball deviates too far from the ideal path, however, it will leave the orbit and start moving along another orbit. This is also illustrated in the video above: timing and height are crucial to the resulting orbit when dropping a ball. In contrast, if one of the ball orbits is globally stable, time and height of a drop do not matter: the ball always ends up in the globally stable orbit. Clearly, if there is a globally stable orbit, there cannot be any other stable orbit. Figure 2: The basins of attraction of the different stable orbits. The map is best explained with an example: In Figure 1, we find that a ball on orbit number 2 (the orbit) is at about 0.1 meters height and slowly falling at the first dashed line. Slowly falling corresponds to a small negative ball velocity. We now look up 0.1 meters ball height and a small, negative velocity in the orbit map (see left arrow). We find that the corresponding area is indeed medium blue, which refers to the orbit. The basin of attraction of the orbit is the collection of all medium blue areas, i.e. all possible heights and velocities that result in the ball following the orbit. 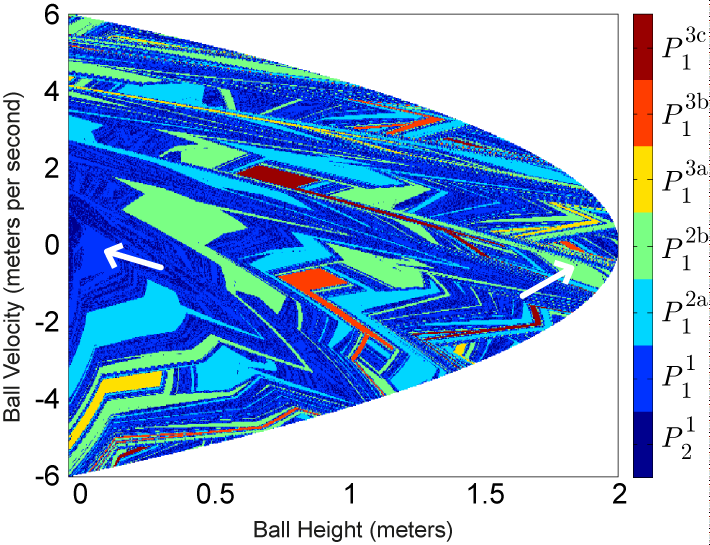 The map also predicts less obvious outcomes: If the height is about 1.8 meters and the velocity is slightly negative (right arrow), the ball will end up in the orbit, after a possibly complicated transition (watch the video here for an example of a non-straightforward transition). The number and the types of orbits we find depend on the specific paddle motion. For example, the paddle motion shown in Figure 1 has a short period at the lowest height where the paddle is at rest. One of the impacts of the orbit occurs in this short period. If we change the paddle motion such that the paddle is not at rest anymore at the lowest height, we do not find the orbit anymore.